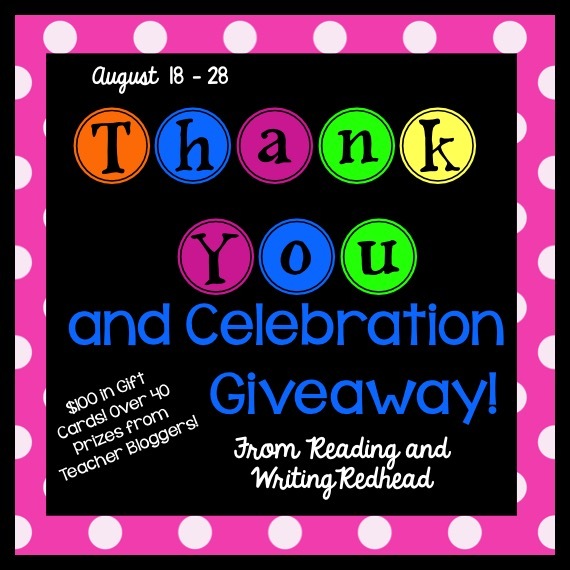 Reading and Writing Redhead: Blog Makeover and Birthday Mega Giveaway! 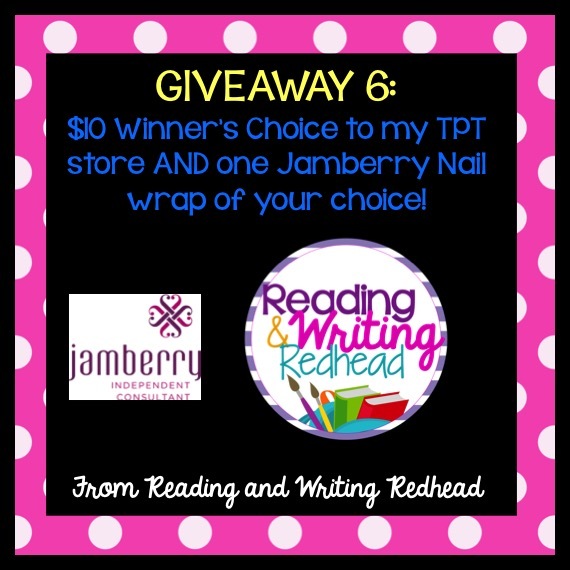 Blog Makeover and Birthday Mega Giveaway! I have a HUGE WELCOME for you! Thank you for stopping by my newly redone blog! My blog was orginially designed in 2012 by the wonderful Christi Fultz from Designs by Christi and this summer she agreed to redesign it! I am blown away by the results!! Please go visit her design blog! I will post her button below. Thank you Christi for working your magic! To celebrate I am having a mega giveaway! I will be giving away more than $100 worth of gift cards, prizes from over 40 teacher bloggers, a Classroom Friendly Supplies Pencil Sharpener and credit to my TPT store and a Jamberry nail wrap of your choice! Interested? Read on! I remember when I started my blog 3 years ago - I had no idea what I was doing or what I was getting into! Pretty quickly I realized I wanted a better looking blog than I could create myself so Christi helped me out. For some reason (well... they are yummy) I wanted a sweet treat theme with cupcakes, ice cream etc. Which in retrospect is great but doesn't have anything to do with reading, writing, teaching or why I have a blog! Live and learn right? Especially after I attended the TPT conference in Vegas (check out my breakdown of it here) I decided I needed to get serious again about the blog and branding and reached out to Christi. Then I contacted some bloggy buddies and they totally stepped up to help! So did Classroom Friendly Supplies (check out their blog here and Facebook page here)! Check out the work Christi did on just my blog button! This giveaway got so awesome and so huge I have to break in down into 6 separate giveaways which I will be rolling out over the course of the next 3 days so if you like this giveaway, come back tomorrow and see giveaway #2, and then the next day and so on! So... let's find out what is included in today's giveaways! one Jamberry nail wrap of your choice! What is Jamberry you ask? Only the best thing ever! If you have never had a sample of a nail wrap, click here or on the image on the sidebar and I will send one along. They are vinyl wraps that adhere to your nails kind of like stickers would BUT they are way more fun and last way longer - up to two weeks on nails and up to 6 weeks on toes. They come in over 300 patterns! Wow! Definitely something for everyone. Here is a collage of my favorite styles! 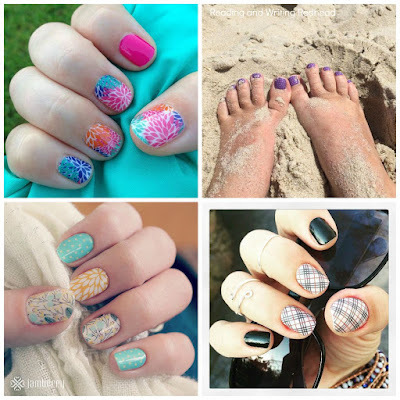 From the upper left, clockwise, they are Punchy Puff, Purple Mini Polka, Upper East Side and Sweet Whimsy (on the thumb and ring fingers - the other fingers have Yellow Lotus and Teal Mini Polka). And these are all retiring on Aug. 31 which means I can't get them after that (don't worry, Jamberry is just making room for some new styles to be released in Sep.)! So I already ordered some more Upper East Side- don't want to run out lol. So let's get to the rafflecopters! 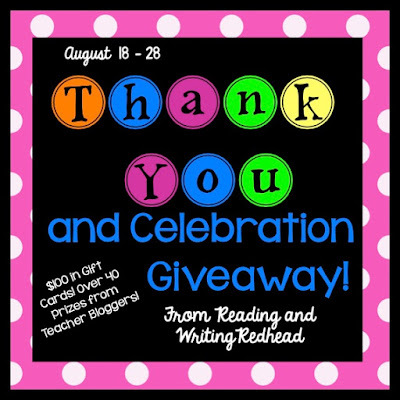 Lots of easy ways to enter each giveaway and please come back tomorrow to see the new giveaways for Day 2! I go back on the 24th and the kids start on the 26th. I have taught for 27 years in first grade. Thanks Lori. Good luck getting back into the swing of things! Today was my first day back-exhausting! Well I am very impressed you had enough energy to check this giveaway out AND comment! THANKS! Teacher work days this week! We started back today. Students start Monday. Good luck getting ready Karen! Awesome new look! I've been in meetings for a while. Tomorrow is the first day with students! I went back yesterday (August 18) My students start August 24. I am entering my 12th year of teaching. Wow you have a whole week of required teacher work before the kiddos come? I don't start back till Monday...the kids come the week after on Tuesday. That's a lot of required days before the actual first day with kids! This will be my 6th year teaching. I've taught primary all 6 years. This year I think I'm teaching 2nd. That's what I teach Sarah! 2nd all the way! I love your beautiful new blog design, Bex! Fantastic giveaway! Great blog design! Students' first day was Wednesday! Wow! Hope things are going okay! With some breaks in service for military transfer, this will be my 4th year teaching. I will be teaching kinder! I have been teaching for 10 years. I teach 4th grade! First day with the kids is Sept. 8th! Teachers go back Sept. 2 and students Sept. 8. Five for Fraturday! We have Giveaway Winners! 5 for Friday Link Up with my Mega Giveaway! 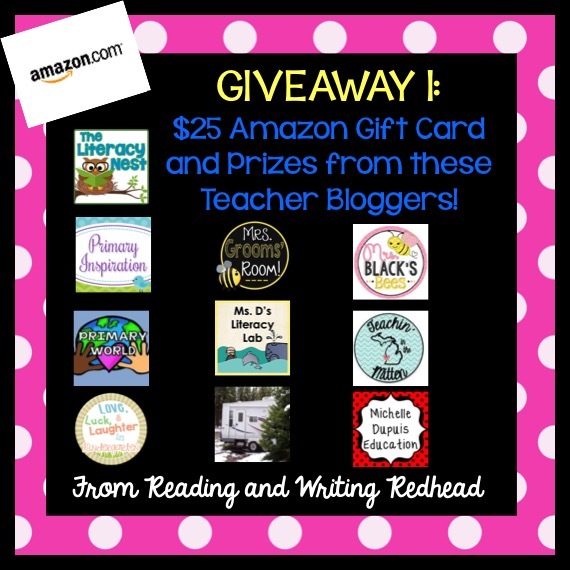 Blog Makeover and Birthday Giveaway: Day 3! Blog Makeover and Birthday Mega Giveaway: Day 2! Blog Makeover on the Way! Back to School Tips - For your Personal Life! Giveaway - a Complete iPad Air Package!